You can’t schedule an emergency, but you can schedule preventing one! Pipes and drains leak, burst, clog and backup. Although these plumbing problems may appear as a surprise, there are usually warning signs well beforehand. We are happy to help our clients have plumbing peace of mind with our annual inspection service. An inspection allows you to spot and address potential problems before they cause significant damage, inconvenience, and expense. You don’t have to guess about the condition of your plumbing. C.A. Taciak & Sons’ yearly inspection service gives you the insight you need to keep your home healthy. Through our informal polling we’ve discovered that no homeowner wants a basement full of sewage. All drain lines have the potential to develop problems. If your drain lines are original to your home it is not unusual to discover issues such as roots, breaks, dips, and clogs. These should be addressed and monitored so that they do not become something worse. Even new drain lines can have problems. Although modern PVC is a super piping material, damaging accidents can still happen. Has your child ever flushed a toy down a toilet, or a house guest send something down a drain they shouldn’t have? Problems likes these cause backups even in perfectly installed plumbing drains. A video pipe inspection is a great way to keep a backup from sneaking up on you. Is your high water bill from your teenager taking long showers or something more serious? A leaking waterline can do more damage than just an expensive water bill. It is not unusual for leaking water lines to create soggy yards, flooded basements, and mold problems on your property. Finding leaks early on prevents a small problem from becoming a serious one. Have you ever considered what would happen if your water heater or washing machine suddenly begins to leak? What would you do if a water pipe bursts in a wall? The first step in any plumbing disaster is to turn off the water. But where is the shut-off valve you need? Does it even work? Plumbing valves often corrode and become inoperable. Exercising these valves on an annual basis makes sure they work when they’re needed. What does an annual plumbing inspection cost? Prices range from $500 to $600 for larger homes. Please ask us about our repeat and referral client discounts. C.A. 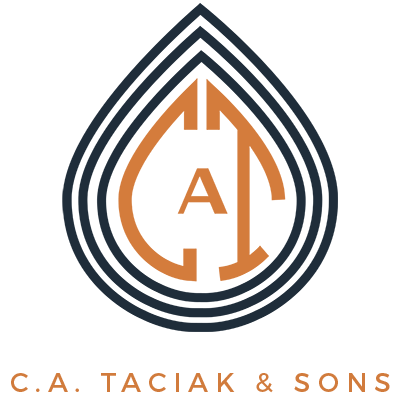 Taciak & Sons Annual Plumbing Inspection F.A.Q. I have had my plumbing replaced already. How will an annual inspection help me? Even if you have had your sewer line, septic system, or water line replaced, an annual inspection service can be beneficial. Like all quality plumbers, we stand behind our work and guarantee a high level of craftsmanship. Even so, accidents can happen to anyone at anytime. The potential for home maintenance accidents is why most people have insurance. But having insurance doesn’t mean you look forward to dealing with the inconvenience, expense, damage, and disruption of a plumbing problem. Our annual inspection service catches issues early on before they become serious. Do you offer any discounts on your annual inspection services? An additional referral discount of 10% to the referrer and the referred if both inspections are ordered at the same. What happens if a problem is found during your inspection? If any potential problems are found during your inspection, we provide several options for repair. Just because something will break in the future does not necessarily mean it needs to be fixed immediately. Whether you choose an immediate fix or not, we do provide a full report of our findings with every inspection. This information allows us to chart the severity of problems from year to year. Using these reports can help you make an informed decision about when to fix any of your home’s plumbing issues.